Synthetic peptide (Human) - which represents aportion within the last 100 amino acids of the human Breast Cancer Gene 1 (GenBank PID 627392), conjugated to KLH. HeLa nuclear or whole cell extract. Any normal human tissue, especially those containing rapidly proliferating cells such as lymphoid germinal centers. Our Abpromise guarantee covers the use of ab9141 in the following tested applications. WB 1/1000 - 1/10000. Detects a band of approximately 220 kDa (predicted molecular weight: 220 kDa). ab9141 at a 1:1000 dilution staining BRCA 1 (+/- IP) in HeLa cell nuclear extract by Western Blot (ECL). Publishing research using ab9141? Please let us know so that we can cite the reference in this datasheet. We bought anti-BRCA anobody(ab9141). Do you know the size of the BRCA detected by this polyclonal Ab? 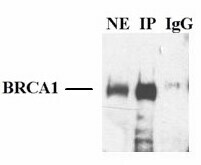 As stated on the datasheet, this antibody (ab9141 -- Rabbit polyclonal to BRCA 1) is expected to detect a band in excess of 220 kDa. Do you have a western picture, I could see? No, we do not have a blot image for this antibody.